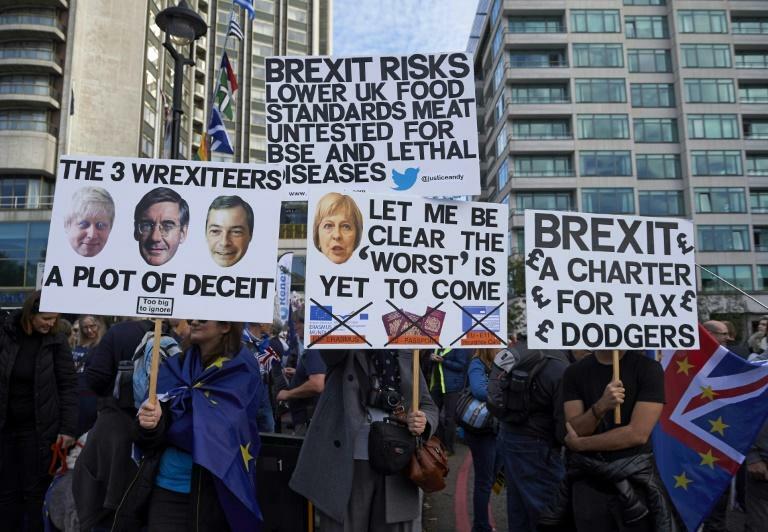 EU flag waving Britons rejecting a future outside Europe packed the heart of London on Saturday for an anti-Brexit protest organisers said drew more than half a million people. The police gave no figures for how many showed up for the massive march and rally outside parliament aimed at pressing the government into holding a second Brexit vote. But the 570,000 turnout figure reported by campaigners would make the demonstration the largest since 750,000 showed up against the war in Iraq in 2003 according to police figures. "This feels like a party," said Liverpool university student Lucy Dogget as she squeezed past a volunteer dishing out bowls of beans on a leafy square facing Westminster Palace. "But it could be our last one before the lights go out." London Mayor Sadiq Khan called Saturday "an historic moment in our democracy" that united "every corner of our country and every section of our society". The marchers came in buses and trains from across Britain and even other parts of the EU. They chanted and whistled while marching in support for causes ranging from women's rights to Britain's beloved but underfunded NHS healthcare system. Some wore blue French berets decorated with the golden stars of the EU flag. Others stuck up signs lampooning Prime Minister Theresa May's negotiating efforts. Many of the posters featured variations on the famous "I have a cunning plan" line from the popular 1980s British comedy "Black Adder". Their point was that May seemed to have none at all just five months before Britain is to split from the EU with or without an agreement of how future trade between the two will function. And all seemed united in a simple message: the Brexit its supporters promised ahead of the June 2016 referendum that set the divorce in motion looks nothing like the one being negotiated today. "I think people were misled in various ways," small business owner Peter Hancock said while tightening an EU flag around the neck of his huge bearded collie. "We want to stay European," added his wheelchair-bound wife Julie. "We can't really see any benefits of leaving, can we, at all." An online petition demanding a binding vote on any deal agreed before the March deadline had been signed almost 950,000 times by the time the march kicked off under sunny skies. May has made it abundantly clear that she has no intention of allowing a Brexit do-over. "They now want a second referendum to go back to the British people and say 'Oh, we're terribly sorry -- we think you've got it wrong,'" she told parliament on Wednesday. "There'll be no second referendum. The people voted and this government will deliver on it." Yet many are not entirely clear on what it actually is that May's government is delivering. The alternatives facing Britain at the moment seems to range from a clean break without any trade deal to one in which little changes except for London losing its voice in the EU. Neither choice holds much appeal to most people. Recriminations over how Britain got here have left May looking increasingly isolated and weak. 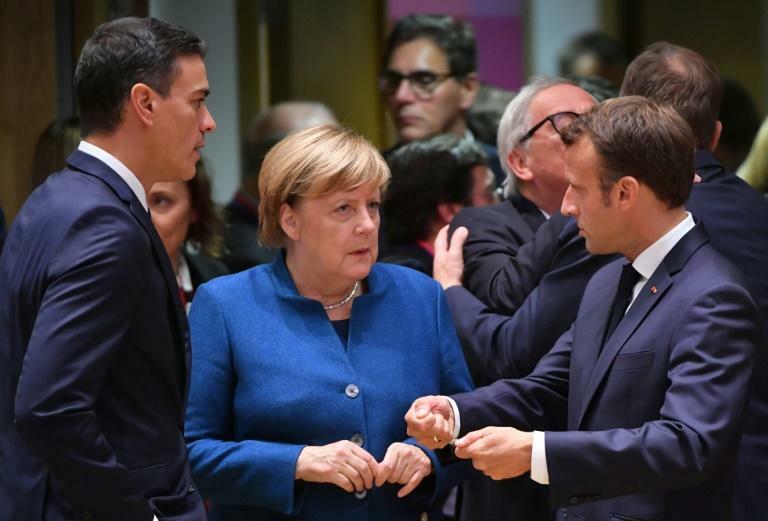 And European leaders such as French President Emmanuel Macron are openly wondering if a second British vote might yet make the mess go away. 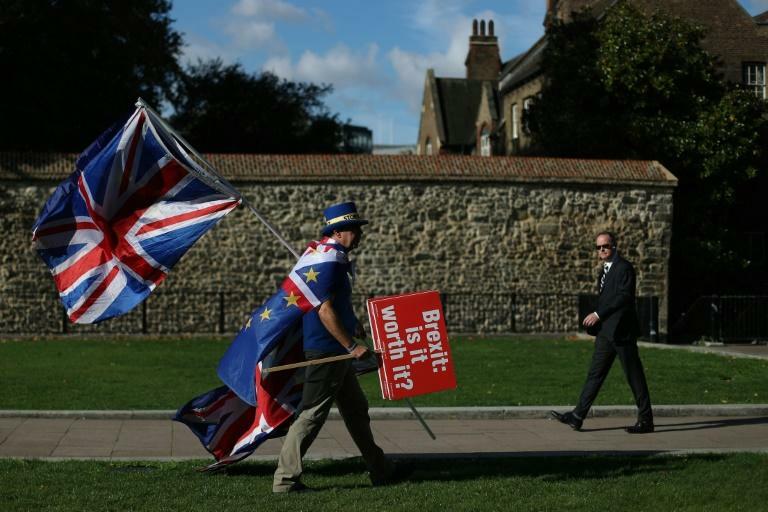 Polls show support for a second referendum evenly split -- the same as with the Brexit vote itself. In the 2016 poll 52 percent of voters backed leaving on turnout of 72 percent. But some think MPs may rally around another vote at the last moment to avert complete chaos once they see what Britain might be forced to sign up to -- and that they must approve. Fiona Godfrey said she took the overnight train in from her new home in Luxemburg because she feared Brexit would do permanent damage to her family life. The 53-year-old contract worker said new British residence rules would make it all but impossible for her new German husband to ever settle in London. "We would have to meet minimum income rules and I am self-employed," said Godfrey. "I'm losing my voting rights, my right to a livelihood, my freedom of movement -- in Luxembourg, which you can cross in 15 minutes."